A new $30-million shopping mall, which will include a supermarket and three anchor restaurants as well as 23 retail units, is due to open during the second quarter of next year in Bahrain. 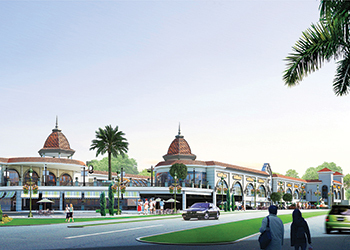 Work is under way on the mall in the Janabiya area of the kingdom, which is being built on a 86,000-sq-ft plot, offering 48,500 sq ft of leasable area. The project is being funded by Kuwait Finance House through First Bahrain Real Estate Development Company, designed by Sanad Engineering and built by Almoayyed Contracting Group. “The first thing you will notice about this facility is its outdoor garden experience, offering an alternative to the traditional indoor mall,” said First Bahrain chief executive Amin Al Arrayed. The facility will feature a landscaped courtyard with soothing water features, surrounded by restaurants and cafés. The facility will offer more than 160 covered parking spaces at the ground level. Developing through its wholly-owned subsidiary FB Janabiya Residential Development Company, First Bahrain said it is expanding from its current investments in the industrial sector.